Insolvent homeowners will have a greater chance of being able to secure the write-off of unaffordable mortgage debts following an important High Court judgment. The ruling emerged after a legal battle between KBC Bank Ireland and a Drogheda couple who fell behind on a €285,647 mortgage on their three-bedroom semi-detached house after both lost their jobs for a time. The personal insolvency arrangement agreed by the court means the couple, Colm and Paula Callaghan, who are in their late 30s and have three young children, can write off about €242,000 worth of debt, including €165,000 due to KBC.This will leave them with a €120,000 mortgage from KBC on a home currently worth €105,000. The bank had appealed an earlier ruling by the Circuit Court granting the couple this deal. KBC wanted the mortgage to be written down only to €270,000. This amount would then have been split in two, with the Callaghans continuing to make repayments on €135,000 of the debt. The remaining €135,000 would have been declared “inactive”and not subject to interest payments at the present time. It could be repaid later in the couple’s lifetimes, or from the sale of the house after their deaths. More than 54,000 mortgages totalling €10.9 billion in outstanding debts were in arrears of more than 90 days at the end of last year, according to the Central Bank. Ms Justice Baker’s ruling is expected to strengthen a customer’s hand in negotiations with banks that want to “freeze” some part of a mortgage for up to several years. This has been a preferred option for many lenders. Instead, customers will be in a better position to push for a full and final settlement, including a possible write-off of a much larger sum of debt, within a shorter time frame – an outcome that could see Ireland’s banks having to sustain significant losses more quickly. I’m lost. Where is the obvious error? That a judge was able to overrule a bank’s wishes and impose an insolvency arrangement? That was always the headline intention and the coverage of the change in the law was completely up front about it. A PIA is the restructuring of mortgage and other debts, up to €3m, with a lower repayment made over a** six-year period**. Sometimes debts are written off. Often a split mortgage, or warehousing, is agreed as part of the PIA. A split mortgage involves warehousing part of the mortgage amount, usually for more than six years. No repayments are made on the warehoused part, with some banks charging no interest on the “parked” portion. But barrister Keith Farry, instructed by Anthony Joyce and Co Solicitors, argued in court that under the Personal Insolvency Act a split mortgage should not be used in conjunction with a PIA. This is because a PIA has a finite lifetime of six years, but a split mortgage could be in place for years before it is resolved. 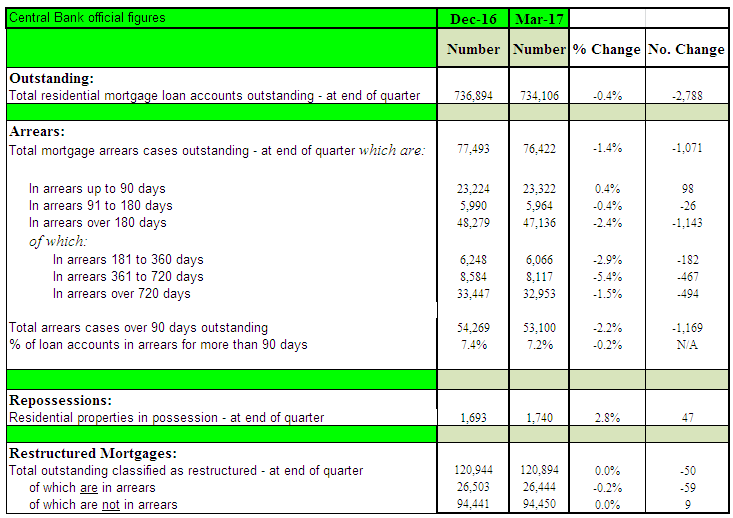 is the restructuring of mortgage and other debts, up to €3m, with a lower repayment made over a** six-year period**. Sometimes debts are written off. Thanks for clarifying. The IT article you originally linked to didn’t make that point clear. Reading the Indo article you’d wonder if the gap might be bridged by defining that the parked amount only becomes payable when the property is sold or bequeathed, and that, in the cases where the proceeds from a sale are lower than the parked amount, the difference should be written off. That would resolve the issue about the parked amount potentially leading to insolvency later in life. A scheme that would involve purchasing the houses of people who are deep in arrears with their mortgages while allowing the owners to stay in their homes could be launched within the next six weeks by a group led by high-profile debtor advocate David Hall. I Care Housing, a not-for-profit approved housing body, is believed to be in advanced discussions with a number of banks about acquiring loans that are in arrears, with a view to allowing the borrowers to remain in their homes for the long term. It is also in talks with pension funds and banks, both here and abroad, about securing funding for the project, which would allow the banks to reduce their stock of non-performing loans without having to seek repossessions. It would seem fair to me that the borrowers in these cases should reside under the same terms as “ordinary” renters. If the tenancy conditions of “ordinary” renters are deemed to be too punitive then why not raise the bar for all ? To some extent I can see how these arrangements should be full and final to allow people to move on. It’s a pity Newstalk didn’t have Researchers as good as this! I have never seen one of these cases reported on without leaving me with lingering questions about some aspects of valuation, payment history, personal circumstances, lifestyle habits, etc. Some of the estates on the southern outskirts of Drogheda are actually in Co. Meath. Might it be the case that people would refer to those houses as being in Drogheda but the PPR would show them with a different address? Interviewer: Leo, what are you going to do about the ongoing repossession problem? Leo: well, I’m going to make these repos faster and less bureaucratic. We need to undo government interference in this area. The Courts/Judges are far to busy trying to write laws/influence legislation when they should be enforcing what laws we already have in place. If the Govt was interfering in the Judicial process as much as they do in the Legislature, there’d be shrieks and cries a plenty out of the Law Library. The Competition and Consumer Protection Commission had a report out on options for the mortgage market. repossess the security on defaulted mortgages as a significant and determining consideration for new entrants. Even where new entrants would be unencumbered by the legacy of a poorly performing back book, when faced with a choice between two markets, funders will choose the one with the less risky outcomes based on previous experience. The risk weighting attached to Ireland is perhaps even greater still given that the Irish market has not dealt effectively with the current NPL crisis, has not put in place a consistent and credible process for dealing with current NPLs and is therefore less likely to be able to respond effectively to any future crisis. Although the eventual conclusions are very mild. 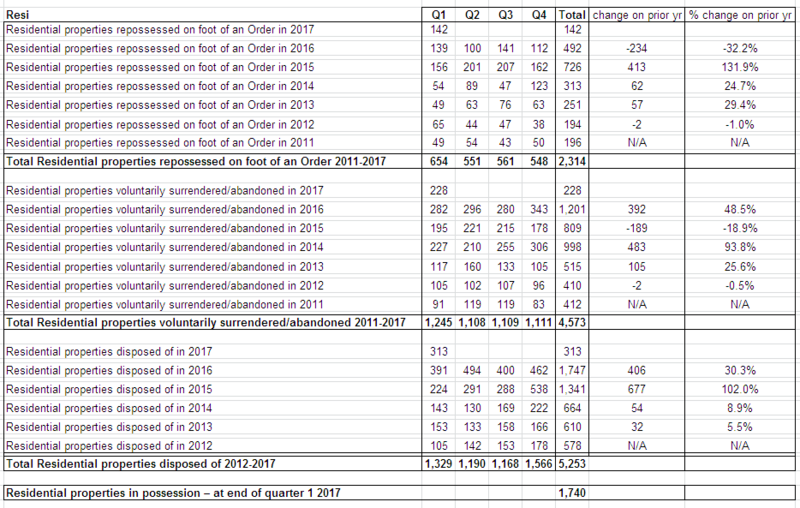 Permanent TSB has said the number of non-performing loans on its books remains “unsustainably high” and it now intended to use a number of strategies - including portfolio sales, foreclosures and higher repayment requirements - to reduce that over the medium term. The bad loan book peaked at €11bn 4 years back. The level of PTSB’s bad loans, at €5.8 billion, have reduced by over 50% from the peak in 2013. Various workouts got a lot of them to ‘perform’ again and recatagorised as performing. Of the €5.8bn of impaired loans around €1.5bn are of the won’t pay and won’t talk type. These are slated to be offloaded to Vultures in some tranches of at least €500m this year.